"Take wheat and barley, beans and lentils, millet and spelt; put them in a storage jar and use them to make bread for yourself." This is by far one of my most favorite breads. No, not just because it is mentioned in the Bible (there are many references to bread in the Bible). I will admit that the Bible reference is intriguing, but I like this bread, mostly, because it is just so good. It is one of those foods that when you eat it you can feel how nutritious it is...each slice is like a meal unto itself. The flavors are incredible, and it's a fun bread to make, also. I've posted on this bread in the past (click here), but like anything, my recipes (like life, I suppose) have a certain fluidity to them...they keep flowing and evolving. There are plenty of recipes floating out there in cyber-space for Ezekiel bread...and many of them, I think, are not very good. Some of them, also, are recipes with sprouted grains, which is entirely different than the one I've included here. But many that are variants of yeasted breads, such as the one included here, state that there is no flour in the recipe...yet they call for grinding wheat and spelt. Um...I'm no food scientist but I do know that ground wheat and spelt (a type of wheat) is flour. What I think is unique to this recipe, and what makes it truly delicious, is that I leave many of the grains whole (other than the flour) and include them in the pre-ferment; when the dough is mixed most are mashed into it, but some, especially the beans, are still visible. Anyhow, here's how I made it (mostly pictures first; a traditional recipe follows). Boil the legumes and grains, beginning with the beans because they take the longest. After the beans are cooked, add the barley and lentils, and then the millet and bulgar. Allow the grains to cool in the cooking liquid. Drain the grains, squeezing them of as much liquid as possible; reserve the cooking liquid. Make a sponge (a sort of mash, really) out of the grains, cooking liquid, some of the flour and yeast. 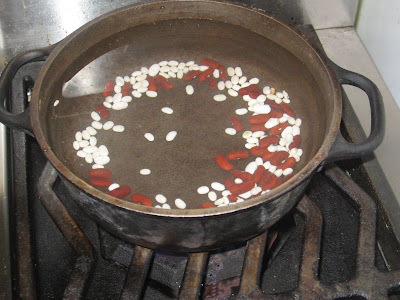 Boil the grains in the water in logical succession according to cooking times: first the white and red beans (about 45 minutes), when they are almost soft add the lentils and barley (about 30 minutes); lastly, add the millet and bulgar (about 10 minutes). The key is that after each addition the previous grain must be soft enough so that when all of the grains are in the pot they will all be equally soft; undercooked grains (especially the beans) can really ruin this bread. And as the grains cook add more water to the pot as necessary because the cooking liquid, which is full of nutrients, will become part of the recipe (keeping a lid on the pot will slow it's evaporation). After the grains are cooked allow them to cool in the liquid to room temperature, refrigerating if necessary. Drain the grains, squeezing them with your hands or the back of a spoon, reserving the cooking liquid. Make a sponge buy measuring 2 1/4 cups of cooking liquid and combining it in a bowl with the cooked grains, the two cups of whole wheat flour, and two teaspoons of yeast. Stir this just to combine, cover the bowl with plastic and allow to ferment from anywhere from 1 to 12 hours. Pour the sponge into the bowl of an upright mixer that is fitted with a dough hook. Add the spelt flour, bread flour, honey, oil, salt, and yeast. Knead the dough on medium speed for 8-10 minutes, or until it passes the "windowpane test." Place the dough in a lightly oiled container, cover it loosly, and allow to ferment for 1-2 hours, or until doubled in bulk. Deflate the dough and allow it to ferment an additional 30 minutes. Turn the dough out onto a floured work surface and cut it into 3 pieces. Shap into loaves and place into lightly oiled pans. Loosely cover the loaves with plastic wrap and allow to ferment for 30-60 minutes, or until double in size and when gently touched with a fingertip an intentation remains. Bake the breads for about 30-40 minutes, adding steam to the oven a few times (either with ice cubes or a spray bottle) and rotaing the breads every ten minutes. The breads are done when they are dark brown and sound hollow when tapped upon. Remove the breads from their pans and allow them to cook on a wire rack for at least 10 minutes before slicing. Looks like a great bread, there is something so primal about the making of a great bread, from kneeding it to letting it ferment & baking it to a perfect food. I can't wait to try it. Hi there! thank you so much for the great tutorial! i made your older version a couple weeks ago with great success! i made one loaf a cinnamon/cranberry loaf. so yummy! i'm going to try this one next! off to start my beans! Thanks for the kudos. I enjoy posting the blog, but more importantly, I enjoy when others enjoy it. Let me know how the bread comes out. Happy baking (and stitching. Unfortunately, after going to great lengths to aquire all the ingredients for this bread recipie, I did not cook my beans long enough and had to pick out the red ones as I kneaded the bread. Next time I will soak my beans prior to cooking and be sure they are mushy so they will incorporate better into the dough. The final product is overly yeasty, almost the texture of quickbread, but still tasty. I hope to try again-thanks for posting this recipie-esp for the pics step by step! Ah yes...one hard bean can ruin the entire batch. And make sure you squeeze out the grains as much as possible otherwise you will need to add more flour. The dough is wet, but the finished product should not resemble a quick bread. Thanks though for reading the blog and mostly for trying the recipe. Let me know how your next batch comes out. I also have a link to another version at the top of this page, and I plan on posting another recipe for it in a few days. what temperature should the oven be when baking the loafes? what is the oven temperature supposed to be? Im not sure I if I missed that information and not reading well or if its just not there.